The job of every fire department and its firefighters holds an extraordinary responsibility. However, the job of an FDNY firefighter has a unique responsibility. Despite serving the nation’s largest city, the FDNY is America’s elite team of first responders when devastation and tragedy hits our nation. It takes a brave and elite firefighter to shoulder such responsibility, but also training and support that is second to none. The FDNY is an elite team of first responders because of the brave men and women who wear the badge, and the support they receive from the FDNY Foundation. The FDNY is one of the nation’s busiest departments, serving over 8 million residents and responding to over 1 million calls per year. Despite such a large amount of territory, dense population and overwhelming demand, the FDNY prides itself in maintaining fast response times. Their average response time to 911 calls is well under the national average of 8 minutes. Without compromising their service to New Yorkers, the FDNY extends their service well beyond the city limits as well. At any point in time, the FDNY has three elite teams ready to respond to disaster areas hit by terrorism or severe storms. These are specially trained teams that are coordinated by FEMA and have been deployed to disasters around the world. Their specialized training assists local first responders overcome obstacles in special circumstances. On September 11th, 2001, our nation witnessed the elite training of this team when terrorism struck New York City. Over 200 New York fire departments and several off duty firefighters responded to downtown Manhattan when terrorists hijacked and crashed two planes into the World Trade Towers. Thousands of firefighters followed their fellow brothers and sisters up the stairs of those towers to save thousands of lives. The extraordinary courage and training of New York’s Bravest became legendary that day. It is the superhuman courage of this elite team of firefighters that allows them to endure the demands of their job and save lives. However, these men and women rely heavily on their training as well. The FDNY Foundation has been the biggest supporter of training programs for the FDNY. As the official Foundation for the New York City Fire Department, the FDNY Foundation promotes fire and life safety education to help the FDNY better protect New York. The FDNY Foundation was established in 1981 to fund awareness and outreach programs for the public, as well as training and support for FDNY members and assists in providing the technology and equipment that helps keep the FDNY the premiere Fire Department in the world. In the wake of 9/11, more importance has been placed on programs funded by the FDNY Foundation. High-ranking officers are provided innovative programs with a solid foundation in management principles and leadership strategy, especially in emergency and disaster situations. Firefighters receive training on specialized courses, technical training programs and curriculum centered on disaster readiness. These programs funded by the FDNY Foundation are indispensable tools for the FDNY and their firefighters. The creation of the Homes for Heroes program was inspired by the brave acts of these very men and women, and the Homes for Heroes Foundation is proud to assist the FDNY Foundation’s service to the FDNY. 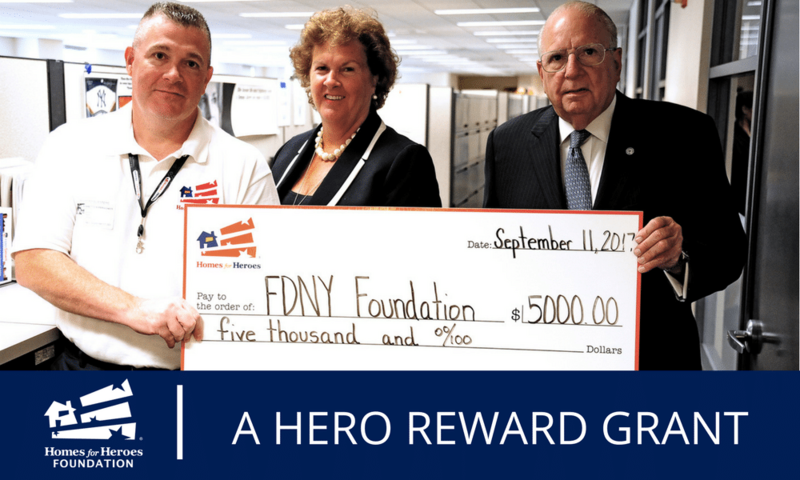 On September 11th, 2017, the Homes for Heroes Foundation presented the FDNY Foundation with a grant for $5,000. The grant will be used for the FDNY Foundation’s Family Assistance Unit. That Unit provides funding to families of fallen and sick FDNY members, as well as assists with medical care and counseling for those firefighters and families who need help due to work related injuries. 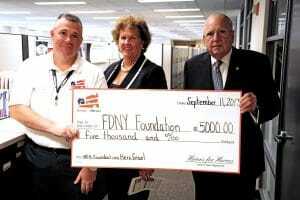 Homes for Heroes Specialist, Benny Persichetti, presents the FDNY Foundation with a $5,000 grant on behalf of the Homes for Heroes Foundation. Homes for Heroes looks forward to continuing our service to FDNY firefighters and assisting them with their real estate needs.